The Pomeranian (also known as the ‘Pom’, ‘Toy German Spitz’, ‘Deutscher Zwergspitz’, or ‘Zwers’) descends from sled dogs of Greenland. ‘Pomerania’ is a district directly south of the Baltic Sea spanning modern day Germany and Poland, where the majority of the Pomeranian’s development was done in the 8th century. It was bred for a thick coat and small size, but still weighed 9-14 kg (20-30 lbs) when imported to England. In England, the Pomeranian’s size was successfully reduced further and a variety of colors was developed. Queen Charlotte and Queen Victoria helped popularize the Pomeranian in England in the 1700’s and 1800’s, particularly Queen Victoria with her Pomeranian ‘Marco’ which she brought back from Florence, Italy. 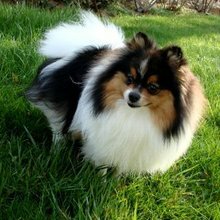 The Pomeranian was recognized by the American Kennel Club in 1900 and since then has continued to shrink in size and develop a more 'powder-puff' appearance. Today it is a popular pet and show dog and the smallest breed of Northern origin. Famous Pomeranian owners are a diverse group including Michelangelo (his Pomeranian watched him paint the Sistine Chapel), Sir Isaac Newton (his Pomeranian once knocked over a candle on one of his important scientific works as he labored upon it), Paris Hilton (her Pomeranian is frequently dressed in matching outfits), and Nicole Richie (her Pomeranian was named after a character in ‘Austin Powers in Goldmember’—Foxxy Cleopatra). The Pomeranian has a soft, fluffy outer coat and long, coarse undercoat. Pomeranians can be black, blue, or chocolate, all with and without tan, and cream, orange, or red, all solid or sable. Other possible colors are regular sable, chocolate sable, wolf sable, ‘Parti-color’ (usually white with another color), white, beaver, or brindle. In other words, just about anything but pink with blue stripes. The male Pomeranian sheds once a year and the female sheds when in heat or after giving birth. The Pomeranian is an energetic, intelligent dog which is eager to learn and very loyal to its family. It is active and confident. Pomeranians bark at suspicious activity and can be trained to make excellent watchdogs. They enjoy cuddling up for a nap or running around like crazy, sometimes both in the same minute. The Pomeranian is an energetic, intelligent dog which is eager to learn and very loyal to its family. It is active and confident. Pomeranians bark at suspicious activity and can be trained to make excellent watchdogs. They enjoy cuddling up for a nap or running around like crazy, sometimes both in the same minute. The Pomeranian gets along well with other dogs and household pets, especially if socialized at a young age. However, it does not tolerate mistreatment and will not enjoy too much attention from young children, as rough play may cause it to grow frustrated and bite. Pomeranians are suspicious of strangers, but will grow used to them when they understand that no danger is presented. You can find Pomeranian puppies priced from $150 USD to $7000 USD with one of our credible breeders. Browse through our breeder's listings and find your perfect puppy at the perfect price. The Pomeranian should be brushed several times a week and bathed only as necessary. Proper dental hygiene is also important; a weekly tooth brushing is required at a minimum, but daily brushing is optimal. The Pomeranian has a lifespan of 12-16 years, though some live as long as 20 years. Common health problems are luxating patella (dislocated knee), patent ductus arteriosus (a heart defect), and collapsed trachea. The Pomeranian may ‘reverse sneeze’, which is a fit of gasping and snorting to remove fluid caught under the palate. This is not dangerous, but may frighten the Pomeranian and its owner; it should be handled by talking to the Pomeranian calmly and gently rubbing its throat. The intelligence of the Pomeranian makes training fairly easy. Pomeranians must be trained when young not to bark excessively. Pomeranians should also be trained not to linger at their owner’s feet, for risk of being stepped on and injured. Pomeranian Puppies for Sale - Shipped Worldwide! Finding the right Pomeranian puppy can be dog gone hard work. PuppyFind® provides a convenient and efficient means of selecting and purchasing the perfect Pomeranian puppy (or Pomeranian puppies) from the comfort of your home, 24 hours a day, 7 days a week. Take advantage of our PuppySearch or leisurely browse our directory of hundreds of dog breeds, Pomeranian dog breeders, Pomeranian dogs for adoption, and Pomeranian puppy for sale listings with photos and detailed descriptions. Some Pomeranian puppies for sale may be shipped Worldwide and include crate and veterinarian checkup. Many Pomeranian dog breeders with puppies for sale also offer a health guarantee. With thousands of Pomeranian puppies for sale and hundreds of Pomeranian dog breeders, you're sure to find the perfect Pomeranian puppy.